We place orders daily and receive those orders that night. What this means to you is that an order placed today can be delivered tommorow. Be it an ink cartridge or 20 file cabinets. Or the "hard to find" item can be in our retail store for pickup the next day. send your wish list to us by email, fax or phone for reduced prices. 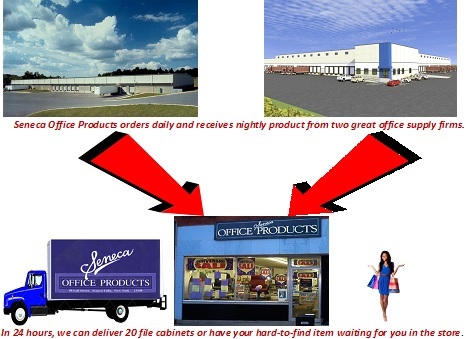 Copyright 2014 Seneca Office Products. All rights reserved.